In light of my last post, I am sharing a very simple recipe that's super easy to make. Believe it or not, this is only the third or fourth time I've made muffins! My excuse is that I didn't have a muffin pan for the longest time, don't ask why - I really don't know. But then it was Baby E's 5th birthday and I told myself I must make cupcakes, so I bought this muffin pan based on the great reviews. I wanted a stoneware one, but it was way out of my budget. Non-stick Teflon was a no-no because of toxic fumes. I really love this one, it doesn't smell, nothing sticks, easy to wash, and the price was right. My life is crazy right now. I have no time to linger in the kitchen. At the same time with our income I can't justify buying 'real food' muffins for $5 a half dozen. Cheap junk muffins with fillers and additives are not an option. Not eating baked goods is definitely not an option with my family, they've gotta have it! So now that I have a muffin pan, I started experimenting with making a recipe that would be a hit. This one is a combination and variation of several recipes, one I can call my own. It is so amazingly yummy! A dozen muffins barely lasts a day here, they are too good not to devour right away, I have to pace myself. I literally hide them out of sight so the kids don't eat it all in one sitting. If you're wondering, and if you are a regular reader you will be, we've deviated from our "cure tooth decay" protocol. I've let grains back into the house, slowly. I know it's not good for the kids' teeth or their attitude. I can tell just by the way white flour and sweets make me feel. Foggy brain, sleepiness, zero energy. The only way we can consume some is in moderation and balanced with lots of veggies/greens and nutrient dense food/fats that feed the brain - coconut oil, eggs, salmon, bone broths, grass fed butter, cod liver oil, etc. I admit, we've let it slide big time this December and January, with the holidays and lots of time outside the home there was a ton of junk the kids ate. Exactly the reason they got sick and couldn't snap out of it for three weeks. It's taking a while to get back on track eating healthy, and while we are at it, I have to compromise feeding them at least home baked goodies with our own ingredients otherwise they'll resort to store bought again. 1. VERY IMPORTANT. Make sure all the ingredients are room temperature, this applies to eggs, kefir, and butter of course. Preheat oven to 425 degrees Fahrenheit. 2. Mix dry ingredients. Whisk wet ingredients separately. 3. Using spatula or spoon, fold wet into dry. Do NOT over-mix and do not use a mixer. 4. Fold in banana chunks. Distribute evenly into 12 muffin bowls. Top with sliced almonds. Yum- I can't wait to try this. I have to limit the amount of muffins I make because I will seriously eat a whole pan in a day or two! Have you tried using almond flour as an alternative? 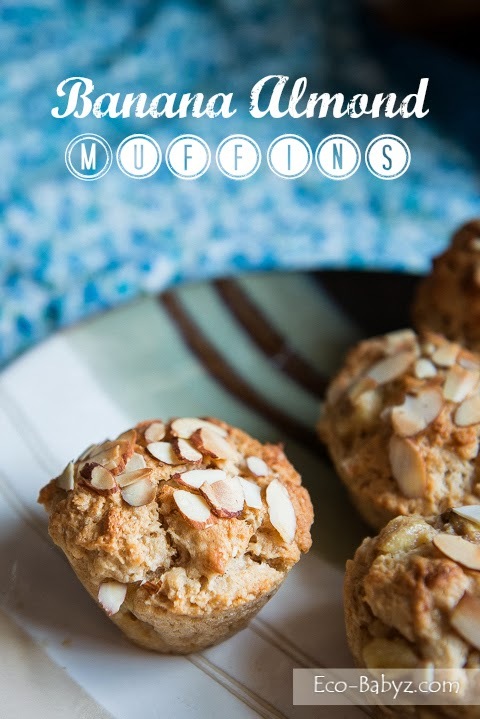 I have a tasty banana/blueberry muffin recipe made with almond flour that satisfies my craving for carbs/breads and doesn't use any traditional flour. I can give you the recipe if you'd like! Thanks for the comment! They are seriously yummy! Oh my word, you're right- my apologies! I even read your original post on tooth decay!! Pregnancy brain must be getting to me. :) Very interesting info, though, and it doesn't seem crazy to mix the two flours at all. It's unfortunate that most of the foods that are best for our bodies cost so much more than everything else!